84 • RV PRO • November 2018 rv-pro.com A F T E R M A R K E T BURNABY, British Columbia, Canada – At the end of each fiscal quarter, Michael Hamanishi, president of Samlex America, grabs the Russian wooden nesting doll placed above his desk. He untwists it and takes out the next hand-painted figure sitting inside and sets it beside the previous one. It's a reminder that time is at work – and that plenty of hard work can be done in a year. 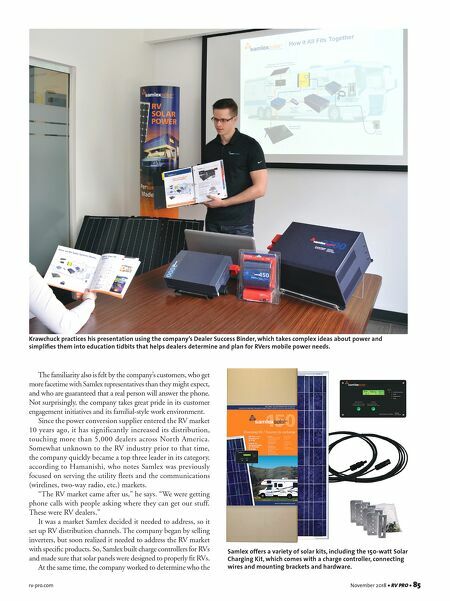 And so far, the power conversion supplier known for its RV solar kits and robust inverters has yielded solid results, with growing sales and market penetration. The quarterly tradition also reflects Hamanishi's collected and methodical demeanor – an approach to organization that can be felt throughout the office halls in Burnaby, located just east of Vancouver, Canada. Like the family of matryoshka dolls in Hamanishi's office, Samlex offers a tightknit, familial setting. Starting at the top with Hamanishi, who maintains an open-door policy, this philosophy has enabled his employees to have open conversations, allowing the best ideas – be it marketing or customer service – to rise to the top. 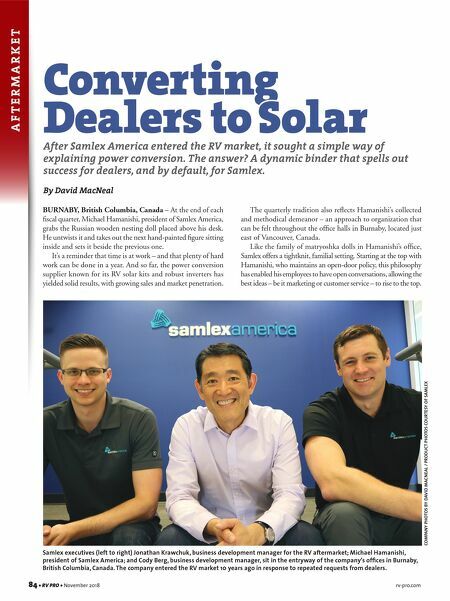 Converting Dealers to Solar After Samlex America entered the RV market, it sought a simple way of explaining power conversion. The answer? A dynamic binder that spells out success for dealers, and by default, for Samlex. By David MacNeal COMPANY PHOTOS BY DAVID MACNEAL / PRODUCT PHOTOS COURTESY OF SAMLEX Samlex executives (left to right) Jonathan Krawchuk, business development manager for the RV aftermarket; Michael Hamanishi, president of Samlex America; and Cody Berg, business development manager, sit in the entryway of the company's offices in Burnaby, British Columbia, Canada. The company entered the RV market 10 years ago in response to repeated requests from dealers.